When Maria from Organically Cooked posted a review on Lunch in Paris by Elizabeth Bard, I knew I had to read the book ASAP. I decided therefore to make it a pick for Cook the Books, the bi-monthly cooking and reading club we started together with Rachel and Deb and here I am today sharing with you a recipe and a review. Lunch in Paris is definitely a feminine book. It talks about food, romance, shopping, staying thin and has many mouthwatering recipes interwoven with the plot. This is not your average women’s read however. Elizabeth writes with wit and is not afraid to show her weaknesses. The things we all try to hide she presents with sarcasm, while her voice sounds familiar, despite the American accent. Most of all, she manages to bring forward her emotions without being corny. What really shocked me in this book were the similarities between the Greeks and the French in the way of thinking. Try meeting someone new at a Greek party…. Greek carrier choices include: lawyers, doctors, engineers. Now computer science and business studies/management /economics have also made it to the list. The humanities, research, or anything creative are usually out of the question (or were, because with unemployment rates soaring, all professions are basically risky). That is why in Greece there are no schools for gifted children. It is considered rude to be that smart. The list is longs and I will not bore you. The only similarity I saw with the American way of living (there are actually many, but they don’t feature in the book), was the amount of food we Greeks like to prepare and eat, especially at dinner parties or restaurants. We like our plates to be full and we always cook more than needed. There ought to be leftovers, or there is a chance someone left feeling hungry. What I loved about Elizabeth’s approach to her new life was her openminded-ness and her sense of adventure. At the market she was not afraid to buy fresh mackerel or a celery root and just cook them in a way she saw fitting. I decided to be adventurous myself and do two things I’d never done before : cook with white asparagus and poach an egg. Asparagus in its wild form grows everywhere in the Greek countryside during spring. It is great in omelets and has quite a distinct taste. The regular green and white varieties are also grown, but they don’t often make it to the Greek markets as they are mainly exported to Europe. Apparently, Greek asparagus is considered really good, ad so when I saw the white bunches at the market I didn’t hesitate to buy them. Elizabeth gives a recipe in her book for green asparagus with cured ham, a poached egg and pistou (pesto) sauce. I decided to omit the pesto, as I was afraid that it would overpower the delicate taste of white asparagus, and opted for a simple lemon and mustard vinaigrette with a touch of white truffle oil. 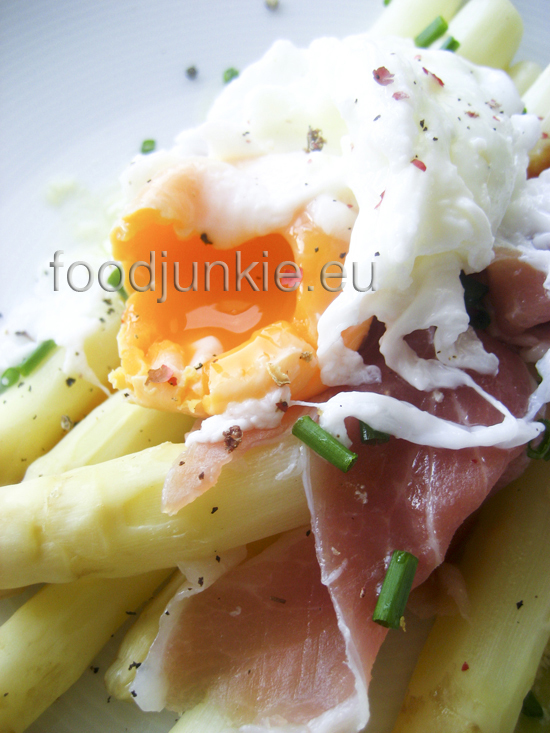 I chose fresh free-range eggs and thin slices of Italian prosciutto to top the asparagus. The final result was absolutely stunning, both with and without the egg (M. doesn’t like eggs). I suggest you give it a try and see for yourself! This CTB round has come to an end. Please join us next time when we will be reading Garden Spells by Sarah Addison Allen. Round hosted by Rachel, The Crispy Cook. Entries due July 25, 2011. Rinse the asparagus and break at their natural point. Using a potato peeler, peel their skins from the top towards the bottom, making sure not to peel the tip. Tie them in a bunch and boil upright in some salted water for about 8-10 minutes. Drain and set aside (you can prepare them a bit in advance and re-heat just before serving). Bring a pot of salted water to a slight simmer and poach the egg (I did it this way) for 2 minutes. Then drop it in a bowl of cold water (with ice cubes) to stop the cooking. You can refrigerate the egg in the water for up to two days and re-heat in the microwave, in medium, for 1 minute. Whisk together the dressing ingredients until you get a thick, creamy sauce. Store it in a glass jar with lid until needed. I actually use the tiniest bit of mayonnaise with all my dressings (we are talking about 1/4 of tsp), as it helps the ingredients blend together. I don’t like mayo that much, but the taste is not noticeable, due to the small amount used. To plate: arrange 4 asparagus stalks on a plate and pour over a tbsp of dressing. Place the ham slices over the stalks, top with the egg and decorate with snipped chives and some freshly ground pepper. The comparisons between France and Greece are endless – but if a Greek tried to point this out to anyone in this day and age when the Greek is seen as little more than a tax-evading lazy con-artist, they would be derided. You chose an excellent recipe to showcase Elisabeth’s book: a good meal can also be a meal for one, and when it’s that good, there is no chance that it will not be multiplied. Brilliant photography by the way – the colours are oozing out of the screen. I REALLY enjoyed your review! That was a great post. And the asparagus, you have me drooling. Gotta try that one. I really enjoyed your book choice. 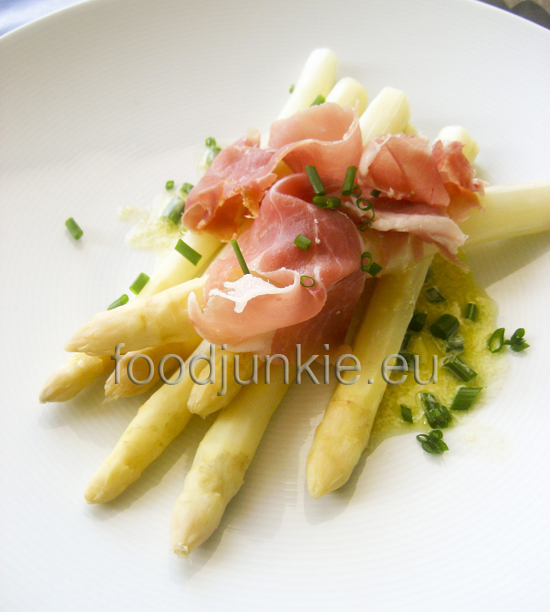 And, what an elegant breakfast, or lunch or appetizer, that asparagus with egg and ham made. With fabulous photos too. I, too, found the line that “if you don’t have a gas bill, you don’t exist” to be very funny. Great book review and choice for our little band of Cook the Book-ers. I enjoyed Bard’s writing style very much. And what a lovely bunch of white asparagus. I shall have to seek some out and cook it up. I have yet to make anything from the book-here is my review http://chocolateandcroissants.blogspot.com/2011/05/lunch-in-paris-review-by-elizabeth-bard.html. There were many recipes that caught my eye. This recipe looks just lovely and now you have me wanting to pull out the book and start cooking. The gas bill line resonated for me too – it’s this catch-22 in England that you can’t get a job without a bank account, you can’t get a bank account without a utility bill, you can’t get a utility bill without a job. Totally frustrating! This dish looks amazing – you got that poached egg at exactly the right point! What an amazing brunch that would be! Thanks for picking such a great book! Your pic is beautiful and the dish looks wonderful. Picking wild asparagus makes me remember scouring bar ditches in Oklahoma with my grandmother looking for the wild stuff!